The idea of having parents come into the classroom can be overwhelming at times, but it is an important step in having them gain an understanding of the learning that happens throughout the day that isn’t able to be sent home in the form of checked work or a neat looking project. 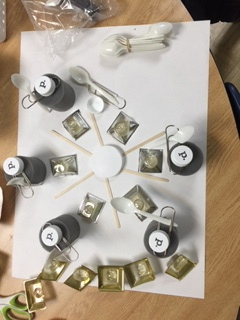 As I began to incorporate more STEM and STEAM projects into my curriculum, I started thinking about how I could paint a clear picture for the parents about just what it was that we were doing. Of course the idea was introduced at Back to School Night and written about in newsletters, but what else could I do. I invited the parents in for a STEAM Night. 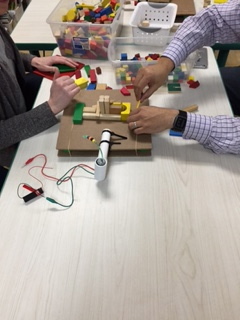 After giving a brief introduction on the acronyms and examples of what this looks like in the classroom, the parents were able to move around the room and participate in activities designed for exploration. Once they had a few minutes to play, I posed some questions and challenges. Shake Tables: Can you build a stable structure that won’t shake off the table? 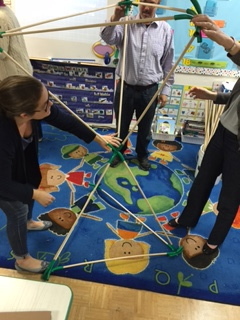 Giant Geometry: What is the most stable 3-dimensional shape you can build? Scrap Mural: What patterns can you create? The parents were engaged, had fun, and asked terrific questions. I hope the experience taught them that the process is the most important part of learning. If having the parents into your classroom for a nighttime event isn’t an option, invite them in for a few minutes before school or to help out with an activity. It’s worth it!